The new iOrbit is a universal smartphone and tablet holder with clamping jaws that adjust from a width of 6cm to 27.5cm (2.4 in. to 10.8 in.). iOrbit features a stainless steel ball swivel enclosed in a cast alloy housing that provides a smooth 360° range of motion and four 90° crenels for unparalleled support and positioning. *Includes IO-C Clamp to mount to iOrbit to almost any stand or boom. The modular IO mounting head allows iOrbit to instantly and effortlessly connect to the included IO-C clamp or any Triad-Orbit product. 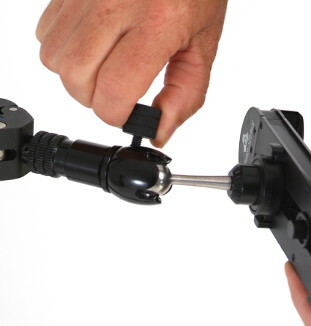 iOrbit expands to fit larger tablets with a grip width of up to 10-3/4″. It fits the 12.9-inch iPad Pro as well as many tablets or phones while in their cases or sleeves. The iOrbit features a brass IO hex mounting head which allows it to instantly and effortlessly connect to the included IO-C clamp or any other Triad-Orbit IO-equipped product. The stem can be positioned up and down the holder, putting the weight of the tablet or smartphone in the center, or shifting it to one side for nearly infinite viewing angles. Max grip width: 10.75 in.